Pallet flow is, simply put, a gravity flow storage solution for pallet stored material. Rollers set at a gentle slope glide pallets down to a front position to be picked by a lift when needed. That’s it. Simple right? If it were just that easy, we wouldn’t engineer several pallet flow rack system designs to accommodate the multitudes of product and storage needs that are out there. 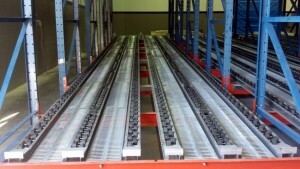 At times we specify a “universal” design to handle all the palletized material in a single system, but often we suggest a varied pallet flow lane configuration that would consist of two or more lane designs working simultaneously. So, how do we choose one over the other? Customers often request use of a universal system to fit their various inventory needs – it’s the easier, possibly more affordable way to go. And it can work, if your pallet load spec is relatively consistent. However, if a DC is using different pallet loads, various pallets styles, size and/or materials, the pallet flow lane will need to be designed around these parameters in order to provide a smooth consistent flow for each pallet spec. Pallet Style – Plastic or pod pallets vs. wooden GMA – unique characteristics of GMA vs n on-GMA conforming pallets require specific lane configuration to achieve proper fit. The rollers or wheels of the lanes are designed to line up with the bottom boards or feet of the pallet. If improperly aligned it will negatively impact the pallet flow performance. Choosing full or split-roller vs wheeled pallet flow rack configuration has a lot to do with the pallet construction as well. Things like the pallet material, type and amount of pallet interface with the rollers/wheels and the orientation of the pallet all play a role in the final lane configuration. Pallet Size – While a small width variation can go unnoticed in a lane, designing for a 54” wide pallet and then using a 36” pallet will cause inefficiencies. Pallet Weight – Heavier pallets often require the use of speed controllers to control the advance, increase safety, and help with tracking down lane. Lightweight pallets can get stuck on speed controllers causing hang ups and slowing processing. Understand general project scope – Step No 1 – what parameters are we designing for? Lane configuration and depth for a small 100 pallet system will demand a unique design vs a 3000 pallet project. Is the system floor level or multi-level? Pallet lane issues are handled differently in floor level vs multi-level systems so safety and ability to access hang-ups must be considered in this example. 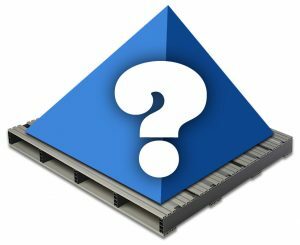 Know you pallet spec and load weights – Don’t stop once you know the max load weight. You need to know minimum/max pallet weights and the volume of each… as well as the estimated future use of each. Determine the ratio of each. For example, if the inventory totals 2000 pallets and 90% are wooden CHEP and 10% are pod, then it would wise to configure a primarily universal/conventional wheeled design for the 90% and designate a small section to handle the unique pod pallets. Look into the future – What is the expectation that the minority could become larger? Plan for that. Full-roller is generally a more “forgiving” pallet flow answer – but caution – assuming that full-roller can handle all styles, weights and sizes is not wise. We offer our testing lab to test out all the pallet variations with appropriately weighted material to ensure lane success across the inventory. 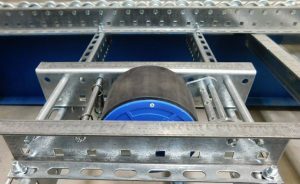 Wheeled systems can be a good design option for varying pallet sizes. Consider adding another lane to handle wider pallets… which would look like the standard system spacing with an added forth rail to accommodate the larger pallets. Pallet weight guidelines – weight variance is ambiguous, however for all the reasons mentioned above you can’t flow a 200 lb. pallet and 1500 lb. pallet in the same lane. General rule for pallets OVER 750 lbs. is to keep weigh variances under 1500 lbs. Pallets UNDER 750 lbs. may require unique lanes to ensure proper speed and flow. Pallet Styles – As stated earlier, you must know the BOTTOM of the pallet to be used – i.e. number and quantity of boards of each as well as pallet orientation and direction of flow. Note: pallet orientation and direction of flow are critical elements used to in pallet lane design. Unfortunately, it can often cause confusion. Next week’s blog with dive deeper into this topic and provide some specific guidelines. As gravity flow specialists our goal is to provide consistent, efficient, long-use products that help our customers achieve their throughput goals. Knowing the project parameters including pallet types, load weights, configuration, inventory rotation and throughput will enable us to design your system customized to your needs. New and retrofit options are available, so give us a call and we’ll get started right away on a solution to your inventory challenges.